Assoc. Prof. Chavanee Tongroach (5th from right), Vice Minister for Tourism and Sports, Mrs. Suchada Ithijarukul (5th from left), Chief Executive Officer of Siam Makro Public Company Limited, together with Mrs. Auea-angkun Tanvisut (4th from right), chairperson of the Makro HoReCa, and honored guests attended the opening ceremony of the “Makro HoReCa 2017” held under the concept of “HoReCa Business Solution”. The event gathers knowledge, new innovations, and a comprehensive range of food supplies and equipment for food business operators and hoteliers, and expects to attract approximately 50,000 visitors. Among the highlights at the event is the “Makro HoReca Challenge 2017” culinary competition featuring chefs from all around Thailand. The winner will receive royal trophy from Her Royal Highness Princess Soamsawali. 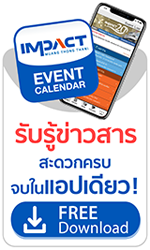 The Makro HoReCa 2017 is scheduled for March 23-26, 2017 at Hall 2-3, IMPACT Muang Thong Thani.